My fish eat in the morning and in the afternoon. I feed them blood worms in the morning and little fishie flakes in the afternoon. I get pretty much all my pets and pet food from a cool little pet store. The picture on the left is of Chubster. Isn’t he adorable?! The one on the right is Cutie. She’s pretty cute too!! I really love my fish. When it comes to cleaning their tank though it gets pretty hard. You have to shuffle the gravel around and get all of the yuckys out. XD 😛 And you have to have a whole bunch of water nearby too! I have all freshwater fish in a twenty-nine (I think) gallon tank. It is kind of hard to have fish because they DO die. I have had, I think at least 12-14 die! You might not think that you could get attached to fish, but you DEFINITELY can. When my fish, Pongo, died whenever I even thought about him I cried. But Chubster has been with me for I think 2 years now! 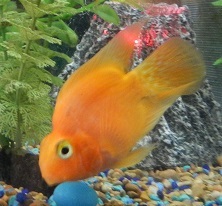 Now, Chubster and Cutie have had eggs before. But not babies. The eggs never hatch. 😦 🙂 Chubs and Cutie love to dig in the gravel by picking up each little rock and putting it in a little pile, by the end of the day,they have QUITE a hole!! 🙂 😛 Haha! If you were wondering what I meant by “I learned that the hard way” I mean that I once put one of my fish in a bucket. Tiger was his name, and… well.. he jumped out of the bucket during the night and I found him on the floor like a month later. So please DO NOT put them in a bucket unless your watching them and/or have the water level low. Or if you have a lid with holes in it on the top. Hope you have good luck with your fish! Oh… and I do recommend keeping them in an Aquarium instead of a fish bowl, but it’s really up to you! . FYI: The green stuff on the side of the fish tank is algae. I just got a hermit crab! Yay! Ooooooh, really!? Yay for you! 🙂 What’s it’s name? I had one at one time…I think…you’re right..I should make another one! 😉 🙂 Thanks! Okay! I’ll do read it!!! Ooooh! Okay! XD No! XD I’ll look! Neat! We have two fish, but they’re just minnows we caught in a creek. They are still fun to watch, though! P. S I love your theme! Thank you! I thought it fit my blog! I love your pics! Your fish are so cool!! I really like cutie. Also how do you get those brilliant photos do you have a under-water camera? No, actually I don’t even have a good camera, but my sister does. That is the one I used. It is waterproof but these were taken from the outside of the tank. We just put them on the computer and I cropped the pictures. Then put them on my blog. I really like Cutie and Chubster. Well wish her luck, and tell her to try to remember more often. I almost always do. Maybe your sister will be able to meet Chubster. it probably is healthy, but you don’t NEED to give it to them. Thanks for the answer. I actually don’t have any fish but my little sister has a couple. She also feeds them bloodworms once a day… if she remembers. Chubster is really cute! I think my sister would probably like him too.